1 head green cabbage, cored and chopped into 1-inch pieces 1 28 oz. can tomatoes with juice, chopped 1 can tomato soup 1 can water Meatballs 1-1/2 lbs. ground beef 1 medium onion, chopped 4 Tbsp. unsalted butter 1-1/2 cups cooked white rice 1 large egg 1 Tbsp. Worcestershire sauce 1 tsp. paprika Salt and freshly ground pepper Add cabbage, tomatoes, tomato soup, water and salt and pepper to pressure cooker (this can also be done on your stovetop). Cook at high pressure for 3 minutes. Simmer on the stove about 20 minutes or until cabbage is tender. Saute onion in butter until golden brown. Let cool slightly. Mix beef, sauteed onion (along with the butter in the pan), rice, egg, Worcestershire sauce, paprika, salt and pepper. Mix by hand until combined. Form into meatballs. Add to cabbage and tomato mixture and simmer over low heat until meatballs are cooked through (approx. 30 minutes. Stir gently during cooking time to be sure meatballs are submerged in sauce. Serve hot in bowls with freshly ground pepper and maybe some rye bread and butter. Enjoy! Oh Patti this cabbage looks heavenly and oh so simple. 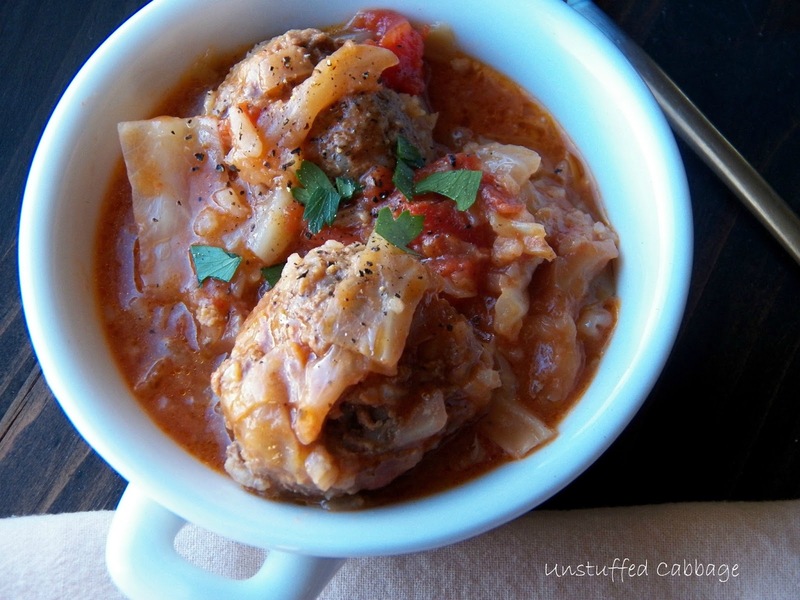 I love stuffed cabbage. This is definitely on my must prepare list!! This looks great. Although "pigs in a blanket" is a favorite around here, i like the ease of this. Tastes the same, maybe even better! I love cabbage rolls, but have never tried unstuffed what a good idea. Next time I will have to try your recipe, thanks for sharing. I was looking for cabbage recipes on Pinterest and came upon this one. It was perfect! Very easy and inexpensive and delicious. Thanks!!! SOUP FOR YOU! Ten Winter Soups to Warm you Up!